LaserLyte, innovators in firearms laser technologies, are unveiling the most entertaining Laser Training Kit ever. Perfect for friendly (and unfriendly) competition, the Shooting Gallery Laser Trainer Kit is packed with value and hours of addictive plinking fun! Including the latest and greatest trainers from LaserLyte, shooters can blaze through an entire course of fire with the Trainer Trigger Tyme Laser Revolver! 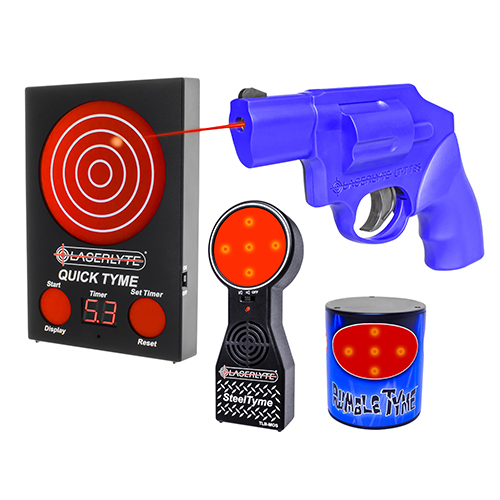 When the Quick Tyme Trainer Target’s clock starts ticking, engage the Steel Tyme and Rumble Tyme targets, then shoot the Quick Tyme target to record your fastest time! 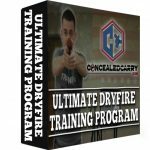 Each of the targets can also be engaged individually for specific training drills—perfect for concealed carry practice. Every Laser Trainer Target in the Shooting Gallery Kit is reactive and auto-resetting, so shooters never need to get off the couch or touch the targets to keep shooting. When shot with the Trigger Tyme Laser Revolver, the Rumble Tyme Target rumbles, rotates and radiates LED lights; while the Steel Tyme Target brings the fun of shooting steel targets to your living room. The Quick Tyme target features a stopwatch that counts until the target is shot, then records your time on the LED display. The Quick Tyme target also operates in Laser Tracer Fire Mode that records shot placement from multiple trigger pulls and then displays the shot location with LEDs in the order they hit the target. Be the first to review “LaserLyte Shootng Gallrey Kit:TT-85,TLB-QDM,MOS,RJ” Click here to cancel reply.